While many people design new bathrooms to achieve a retro feel, others are forced to work with what they have to update an outdated bathroom. Many in this group are dumbfounded about how to make their spaces look, feel and function better without spending a lot of money. This is especially the case with those who have bathrooms filled from top to bottom with brightly colored porcelain tiles and accessories. Experts say that giving these retro bathrooms an update doesn't always have to mean gutting them and starting over. Instead, changing out a few key pieces can help to tone down the look and make it more modern. 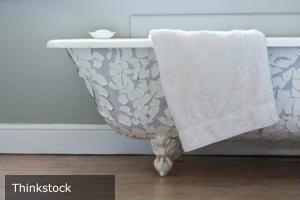 "One option is to replace just the sink and toilet and leave the tile and tub intact," Shelterpop.com advises. "A white toilet and a simple vanity can freshen up the look of a retro-feeling bath without the hassle of a full renovation. Plus, newer models of toilets are much more water-efficient." Installing a new bathroom faucet that has a retro style but functions better along with new lighting fixtures and bathroom accessories can also instantly modernize a tired, old space. Design experts also suggest painting the walls as a simple and effective way to give a room a new look without spending a lot of money.